The scam appears in several different variations, all using the domain ‘optusnet.com.au’. All variations are designed to result in the same goal, tricking the recipient into running a malicious .vbs file. Below are 2 examples of this payload email scam. 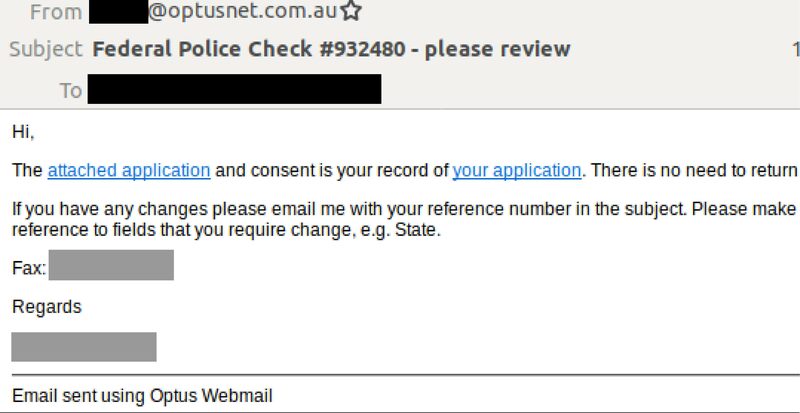 The first example of the scam advises the recipient that their 'Public Question/Statement Time Request Form' is attached. Appearing in plain-text format, the email body claims the copy is attached as a 'MS Wd' as the form made the font very small. The attachment is a ZIP archive, which is password protected. The message body includes the password to access the archive. Inside this ZIP archive is a malicious VBS file. MailGuard found both the above malicious emails come from what appear to be compromised ‘optusnet.com.au’ accounts. While the plain-text nature of both emails and the fact that the recipient isn’t addressed directly are strong indicators that these emails are malicious, the email scam does employ several elements to convey legitimacy and a false sense of security. This includes the use of a password in the first example to access the archive. This not only boosts the legitimacy of the email, but also makes it harder for email filtering services to access the payload directly. Hence, it is less likely that the email will be classified as a scam. MailGuard urges all cyber users to be vigilant when accessing their emails, and look out for tell-tale signs of malicious emails.